Kilmokea is a very ancient site in our parish. It is believed that there was a large monastery here in the sixth century covering over twenty acres. It was built on Great Island, when it was an actual island and was of great importance as the monastery controlled the River Barrow and ferry crossing to County Waterford and Kilkenny. It's also close to Waterford Harbour. We know that the Island or Hervey's Island, as the norman Hervey de Monte Marisco was granted the lands here, had its own town.Two stone castles were built on the Island also. The rampart of the Viking fort can still be seen as can the church site and cemetery. No doubt the Vikings,when they arrived in the eight century could see how important this monastic site was. The remains of a horizontal water mill was found here in 1968 when Colonel Price was the owner and can be seen in the garden behind Kilmokea House. The cemetery contains items of great historical interest and are well worth seeing. These stones,called Bullaun Stones, are to be seen just inside the entrance gate.There are three of them here.They are bowl shaped and were probably used as baptismal fonts or holy water fonts. The larger one could have been used for grinding corn as a quern stone.The monks also used them to grind medicinal herbs. The fonts were from the church which was here and the remains of its outer walls can still be seen. This is a picture of a sacrificial stone found within the rampart. 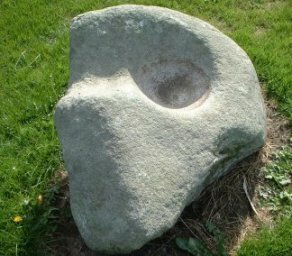 As you can see it has a bowl shaped depression for the head and a channel for the neck to lie on.It's also called a guillotine stone and is of granite and is 26 inches in length.It could have been used to slaughter animals or humans. The celts had the custom of headhunting.This cruel custom involved beheading the enemy and taking it home as a trophy after a battle. We know too that they offered human sacrifices to their gods. This stone,which is in the cemetery, is probably the base for a high-cross and is of granite. The cross itself is no longer here. 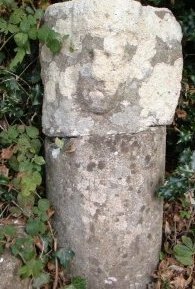 This unusual head stone has a skull and cross bones carved on it. On the back it has an inscription and the year 1739. There is a history of pirates attacking vessels on the River Barrow in this area. This stone with a head carved is in two parts and can be seen just inside the main entrance to the cemetery. 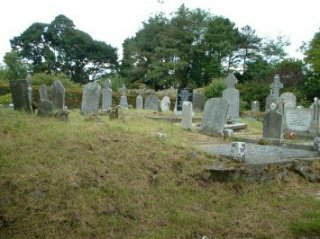 If visiting Kilmokea Cemetery please respect the artefacts to be seen and that this graveyard is still in use. Thanks to Tom Kent,Loughtown,Great Island for his help. Seán Crowley.